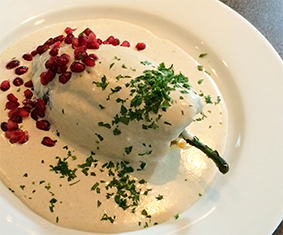 Chile Poblano filled with picadillo (chopped beef and pork meat, nuts, fruits and spices) topped with a Nogada Sauce (walnut-based dairy sauce) garnished with pomegranate seeds and parsley. At El Naranjo Restaurant & Bar we are dedicated to serving delicious traditional Mexican food. We create savory salsas and moles, well-seasoned food with great concern for finding a pleasing balance of flavors. We bake our own bread, make our own corn tortillas and use fresh vegetables and herbs. While the food has a strong culinary resemblance to our former internationally acclaimed restaurant in Oaxaca, we draw from the many rich traditions of Mexican cooking.